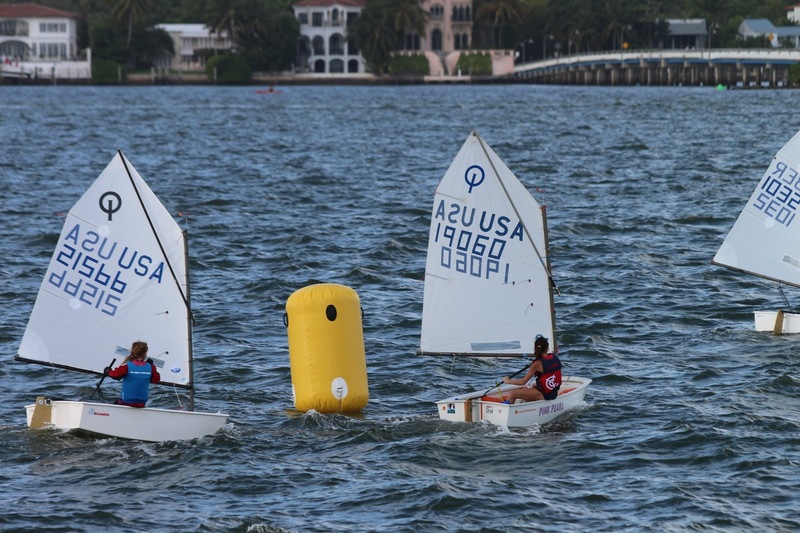 The day after Christmas, I was invited to attend the 2015 International Children Regata held in Biscayne Bay, FL. Children between 7 and 14 from all over the world (mostly South America, Germany, South Africa, Florida, ...) participated for four days. My granddaughter is eleven. For the past five years, she has been attending two to three-week summer sailing camps in Lake Michigan. No comparison with some of the participants from warm climate who sail most of the year. On December 26, she went to the specific marina to prepare her 8-ft sailboat that has been shipped from Chicago, and received her instructions for the next day. A friend of my husband invited us to spend the day on his catamaran. Before boarding, we dropped the excited young girl at the marina, where she joined her coach and the hundred participants. Our friend sailed to the middle of Biscayne Bay to allow us a great view of the race. Unfortunately, the ocean was rough and the waves high. The small boats paraded around ten o’clock, then the young sailors lined up their boats and the first race started at 10:30 am. They had to sail to an orange barrel, then turn around and reach another barrel on the opposite side and return to their starting point. My son and husband each equipped with a big binocular followed our granddaughter’s every move. “She made it to the first barrel and spun around.” Great, her frantic mother and I sighed with relief. Even without binoculars, I could see our little darling bailing water out of her boat that was drifting dangerously far. Good God, she is only eleven. Apparently, we were not the only ones watching the drama. Her coach raced toward her on a motorized dingy, helped her bail for a moment and then towed her toward our boat. She jumped aboard for lunch while her dad and little bother tried to continue bailing. No experts here. The nine-year-old boy fell in the water. His dad ignored the sailboat to save his son who got injured by the rudder (a blade-like appendage used to steer the boat). Meanwhile the boat filled with water and capsized, sinking and completely disappearing under the catamaran. Try to imagine the panic and our sweetheart crying her heart out while losing her boat and the race on day one. But the brave young coach returned--by the way, she was only 19. She threw her arm and half her body under water, and managed to catch the top of the sail. She and my son pulled and pulled and brought the boat up, turned it and bailed it. Half an hour later, our granddaughter was back in her boat. 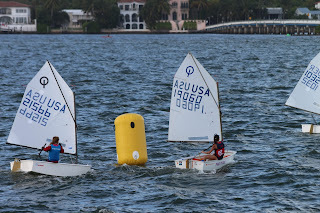 She finished the two other races of the day without problems, and the fifteen races that followed over the next three days. And our happy little girl received a medal!! The moral of the story as my husband put it: Even if you are completely under water, with perseverance you can get up and win. New York Times and USA TODAY bestselling author, Mona Risk, visited more than 100 countries. She's also a doting grandmother who loves to include babies and children in her romance novels. My goodness what a saga! As a kid her age I sailed cadets. Fell in one too many times and gave it away! Gave me a chuckle. Thanks, Mona! Whew! Glad everything turned out well and sincere congrats for her winning a medal! Wow! What an exciting adventure, Mona! You must be so proud of your granddaughter!